If you are an entrepreneur, a small business owner, or someone who is responsible for a specific business unit in your company, pay close attention. The difference between working in your business or on your business can make a HUGE difference in how successful you ultimately are. Knowing the difference between working in your business working on your business is huge. Sometimes we can get trapped into thinking we are working on our business because of the level of importance we give an activity or task. When, in reality, we can actually delegate or outsource the “important” task or activity leaving us the creative space and time to breathe life into our businesses. 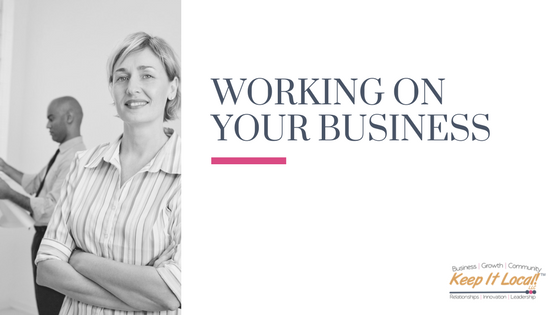 Working “in” your business ties you down with tasks and activities that can be easily automated, delegated or outsourced. Put a check in the column with your name for absolutely every task that must be done by you. Now that you have a sense of what type of tasks you can delegate or automate, it’s time to start! You may not be able to do everything all at once…that’s ok! Start with what makes the most sense, what you can afford, and then, grow from there. For me, the first thing I chose to delegate was bookkeeping! Bookkeeping was by far, my least favorite task to do – EVER! As a result of giving this one task away, my taxes are so much easier to prepare and my accountant seems to be a little happier too! What are you waiting for? Go work ON your business!